Home > Anitra , daily specials , Favorite Authors/Books > My Favorite Book? I'm not sure I have a favorite book. Unless Dr. Seuss' "Oh, The Places You'll Go" counts. There are definite Lucado and Beth Moore titles that I highly recommend. And, of the four books I'm reading right now, "The Circle Maker" tops the charts. But, a favorite book? That stumped me. In fact, my husband says he's never heard me utter that phrase. It took me more than a minute to think this through, but I kept coming back to a book that's been on my shelf since 1998. Have you read it? 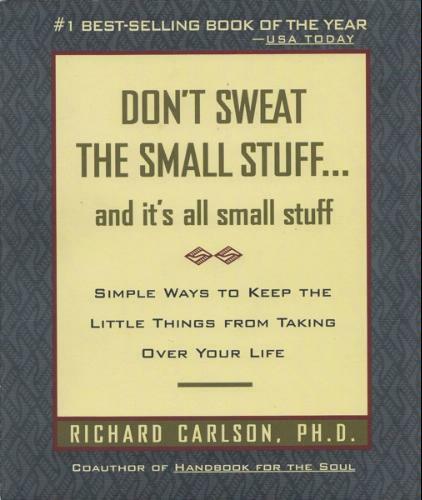 "Don't Sweat the Small Stuff...and it's all small stuff" crept into my life when I was sweating everything. This tiny book has 100 ways to minimize stress and maximize real living, and while it's not a Bible study, I'd use it as a part of my devotions--there are a number of chapters with relevant verses scrawled at the end. "...the purpose of life isn't to get it all done, but to enjoy each step along the way and live a life filled with love..."